The allure of the Guaranteed Prize Pool (GPP) contests is the hope that with a small investment, a fantasy owner will have the opportunity to win a huge prize worth many multiples of the original entry fee. However, all too often, the opposite tends to take place as players pour more and more of their precious bankrolls into these large contests and never see a big payday. Obviously, the main culprit for these losing players is simple bankroll management where too much is put at risk in ways that nearly guarantee losses over time. The other, much less obvious issue is in how a player crafts his lineups to begin with. Each season, we collect data on the winning lineups from most of the large prize pool $3 GPP events all the way up to the winning lineups for the $400 GPP each week. In previous years, there was a lot of debate among various people within the industry about the construction of cash lineups versus those used for GPP events. While much of the debate has largely been settled since the early days when just a small handful of site vied for attention within the industry, the perpetual question of lineup construction for GPP events still looms large. If you’ve never considered the concept of ownership outside of the idea of chalk vs contrarian plays, this should be a column that helps you to recalibrate your process in terms of your overall roster builds from week to week, whether you are mass entering 150 lineups, or simply taking one or two shots at a higher dollar entry event. We are not here to say that there is a one size fits all approach to lineup construction, but in looking at it each year, we can fine tune the total range of ownership which gets us close to an optimal aggregate ownership as well as the individual ownership levels for each player that you can target. This won’t guarantee you success, but it will certainly help you in avoiding failure before the first golfer has teed off to start the week. Before we dive in too deep, we do feel that it is extremely important to reiterate some key points about GPP play that we try to abide by before we even start to build our teams each week. As we stated above, the easiest way to wreck your bankroll is by putting too much of it at risk each week and also playing in GPP events that do not allow you to make enough lineups to be truly competitive week in and week out. A quick rule for playing GPPs is to put only about 20% of what you risk each week into GPP events. Now, if you have an enormous bankroll and can handle the swings that come from boom or bust weeks, maybe you will be comfortable playing a larger percentage than that. But until you have built your bankroll up into a comfortable five figure range, this just is not going to work very efficiently. Remember, only a tiny portion of all players in DFS are making enormous profits especially with DraftKings making incremental increases to the rake. These professional players are able to profit due in part to players that mismanage their funds on a routine basis. Take your time and utilize the blue print that we lay out for you and you will avoid getting eaten by the sharks out there. The first idea that we want to discuss when it comes to the argument of cash game lineup versus GPP lineup is a point that we probably have not stated as well as we could have in some of our earlier writings on the subject. The idea of building a winning cash team for us revolves around the idea of keeping variance to a minimum level. For 2017, let’s look at a couple of players to help us in illustrating this point. Since rediscovering how to putt the ball near the hole over the last two seasons, Lucas Glover has become one of the more dependable cut makers on tour. In 2017 (not including fall seasons) Glover played in 22 events, making the cut in 18 starts. His price moved from being ridiculously low in the high 6k range all the way up to the mid 8k range as he established himself as a consistent presence through the weekend. Playing him in cash throughout the year was an easy call as his salary did not usually work against you and while it is still not a fun experience to watch him miss opportunities on the greens, he’s remained one of the more reliable guys to get you 70 points on an average week. However, of the 22 events he played in, he made the Top-10 just twice and finished in the Top-25 six times. Certainly, these are not bad numbers at all, but with his limited upside, it makes him far less compelling for GPP contests than cash games. On the other side of the equation, we have players who are less suitable for your week to week cash lineups, but who can be explosive if you catch them on the right week for GPP purposes. The name that pops into my head most prominently from 2017 would be Si Woo Kim. The young, 22 year-old South Korean has flashed immense talent over the last couple of seasons on tour, but has also been plagued by back problems that have sidelined him and even forced several withdrawals, particularly last season when he led the tour with six. However, we know that when healthy, he has enormous upside and has a win each of the last two years with a surprise victory at The Players Championship last season serving as a highlight. If his back issues can be worked out, he has a chance to be great on tour. If not, he could fall by the wayside very quickly as a phenom who never realized his potential, almost the same way as a player like Anthony Kim of several years back. You obviously cannot take the risk of using Si Woo in your cash games each week, but if you’re multi entering GPP lineups, even a 5% sprinkle with Kim will typically have you overweight the field so that if he does catch fire in a given week, you’ll be one of the few that benefits from the upside. This takes me to another idea that is really worth touching on and that revolves around lineup construction for large GPP fields versus small GPP fields. We are going to see this illustrated really well in the $3-8 versus $300-400 GPP data, but the central idea is this: the fewer entrants in the GPP (usually those that are more expensive to enter), the more an owner should focus on building a lineup resembling a cash game team. 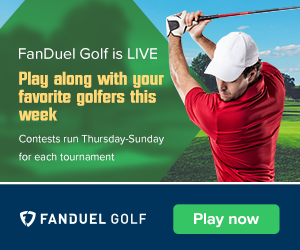 When we spent time in 2015 attempting to qualify for the Fantasy Golf World Championship event and playing in the $1000-1500 Clubhouse GPP this past season, we each entered one lineup per week in a field of 40-50 entries. Typically, only a few of those teams would get all of their golfers through the cut. In a difficult week, that could drop down to only a couple of teams. The advantage of having one of those few teams going into the weekend was tremendous and immediately put your team into position for a win, even if your six players only played average over the final two days. Contrast that with the $3 GPP that ran each week with close to 120,000 entrants. The same percentages of teams (10-15% each week) make it through the cut fully intact, but now, instead of needing to beat only a couple of other teams, you probably needed to beat 20,000 and now, unless each of your six golfers played really well over the weekend, you may still find yourself well outside of the top 1,000 teams for the week and winning only a small amount for your troubles. The takeaway here is really important, but not always understood very well: in order to be successful in large field GPP events, you need to be comfortable being more aggressive with the golfers that you choose. If you are playing the same chalk plays at $400 as you are at $3, your chances for success are going to be pretty low for the smaller buy in events. We have discussed this idea before with the thought of keeping your lineups boring for the more expensive events and more dynamic with the cheaper events. When you play in cash games, you will typically notice that most of the players tend to stick to the chalk pretty closely. While some do get a little more aggressive with their lineup choices, it is usually advisable not to stray too far off the beaten path. It does not make a lot of sense to take the risk of owning a player that is only owned by 1% or 2% of a cash game field. When that particular player does really well and your lineup finishes at the top of the pack, your prize is the same as if you had finished right in the middle. However, when that player does not do well and misses the cut, it obviously hurts your team, but more importantly, it did not hurt many other teams in the contest, thus putting you at a major disadvantage. On the other hand, if you select a chalk play owned by 50% of the field, if that player makes the cut, he will reasonably help your team towards staying in the top half of the field. However, if that player misses the cut, your team will be hurt, but so too will 50% of the field so that when this happens, it does not immediately kill your chances of cashing in the contest. This is why the scores of cash game events tend to be a little lower than in GPP events. There is little incentive to take big risks. This is a major difference strategically in how to play cash games versus GPP. For some, this is rather self-evident, but it is a topic that still is misunderstood by some players and worth putting some thought into when looking through the field of players each week. It is true for all DFS sports, but especially strong for golf when variance can run higher than other sports. In NFL DFS, some of these plays become painfully obvious when injuries are reported in the middle of the week and backups that are near minimum salary now see an expanded roll. While there is nothing quite like this in PGA to work with as volume is not injury dependent, there is an area where we exploit the pricing scheme each week and that is in looking at the way that DraftKings and FanDuel have priced the players each week in comparison to their odds to win the event. Using the Odds vs Daily Pricing tool, we can get a sense for where the algorithms are differing from the odds makers each week. When combined with course history and recent form, we start to see a picture of not just who should have success but also for ownership trends as well. Typically, your top name players are always going to be priced up so that alone can steer ownership away, but what we’re looking for are those players in the more affordable upper $6k to lower $8k range for our cash games each week. Simply being higher owned and affordable is not going to guarantee success, but it is also a good way to preserve some salary cap dollars and also helps to hedge some risk as you will not be overly dependent on that player for your overall success or failure that week. While not straying too far from the crowd can generally be a positive in cash games, it’s typically not going to be the optimal approach for tournaments. In fact, typically, you want to err towards a more contrarian approach overall in avoiding some of these higher owned value players from the middle ranges. There are a couple of easy examples to point out, but you will see this almost every week during 2018 where some player who is slightly mispriced will end up being 30-40% owned in a GPP field where when you look back at it, you realize they should have been easier to fade even if they did appear to be in a good spot. Charles Howell III is one of those players who will always be heavily owned in cash and rightly so as he has consistently made the cut in events throughout his career and he also keeps a very active schedule on tour each season so when you look at course history for a given event, his tends to be quite extensive which makes it a little easier to have confidence in each year. However, he’s certainly not a player that has dominated the tour in terms of wins as he’s had only two with the last one being over a decade ago. He’s certainly someone who can post a Top-25 finish, but he’s also capable of a lot of middle of the pack finishes as well. Going into the Arnold Palmer Invitational last season, his price of $6,900 drew a lot of attention as he’s consistently made the cut there and posted a few Top-25 finishes, but also no finishes higher than 20th over the last decade. His ownership numbers ended up approaching 23% in the lower end GPP events all the way up to 31% for the $333. He did make the cut, as he usually does at Bay Hill, but finished 56th and scored only 46.5 points on DK. If you owned him in GPP events, even without missing the cut, you killed your chances by chasing the crowd here and you did it for a player who had an upside that was probably only a 20th place finish. This is the difference between cash games and GPPs in a nutshell and why you have to adjust your mindset from one to the other if your aim is to be successful in each. One other really good example to note, as it is a situation that we see that pops up almost every season is when a player on the European Tour starts to gather some momentum overseas and then comes over to the US to play in some bigger events on the PGA Tour, was Peter Uhlein in 2017. Uhlein played well in college at Oklahoma St, but then went overseas and has played on the European Tour the last few years, trying to build up his game in order to be ready for the high level of competition on the PGA Tour. His progress came slowly, but in late 2016 and early 2017, he hit his stride and looked to keep his success going back in the US. Many DFS players had watched Uhlein’s progress and were ready to pounce when he returned, particularly after a few promising finishes in Puerto Rico, Houston and Muirfield (5th, 23rd, 25th). His $7,200 salary for the St Jude pushed players into a frenzy and his ownership numbers climbed to around 40% across the board for the week. Unfortunately, he hit the MDF wall on Saturday and obviously did not return value for the tournament. Uhlein is a very talented player and capable of pulling off a win, but one factor worth noting in looking back at the numbers for the season is that in small ($3-8) GPP events, no winning team rostered a player at 40% ownership or above for full field events and only two winning rosters contained a player owned at 40%+ in the medium sized events ($20-33). When you get this sort of hysteria around a player, even if you can see the potential, once a player generates enough buzz to get them into the upper 30% to over 40% range, there is just little reason to chase these players for GPP events. There is a far better chance that they trip up and hurt 40% of the teams out there than there is that they finish in the Top-10 and hurt your team due to your fade. While making the fade is painful, your expected value is much better if you consistently dodge these mid-tier value players when they become too popular. So now that we have discussed some basic ideas on lineup construction, let’s address a few thoughts on how many entries you want to have in events based on the cost of entering and the size of the field. Whenever we play in a $1,000-1500 event with smaller fields below 100 players we never enter more than one or two teams at the most each week. With one entry out of 50, we immediately represent 2% of the field. In the $300-400 GPP, we like to have at least 3-5 entries, somewhere close to 1% of the field depending on the week and size of contest. On the other end of the spectrum, DraftKings has changed its contests up a lot over the last year. When it ran a $3 GPP for $100k as the top prize, we would do 150 lineups per week in hopes of hitting a nice payday. While that was still only a small percentage of the total lineups in the contest, it gave us enough ammo at a lower buy-in to really be able to mix in a few wildcard plays around our core group for the week so that we actually had a shot of getting paid off when a 1% owned player made some noise. We’ll have to wait to see what DK elects to do with PGA contests this season. Last season, everything below an $8 buy-in was capped at 20 entries. If you enter a 3 or 20 max contest, you should do the maximum number of teams for that event as the goal is to be on even footing with the other competitors. If you cannot afford to max out the contest, drop down to a price point where it fits into your bankroll. If you do need heed this advice, you are going to put your bankroll at risk too quickly and will more than likely be wiped out and wondering where you went wrong. Poor bankroll management is the number one reason why players do not have success in DFS. They want a shot at a big prize and they turn the experience into a couple of lottery tickets in Millionaire Makers or other big prize pools. If this is just for a weekend of entertainment a few times per year, there is nothing wrong with that approach, but if you want to be making money year after year, you need to be disciplined enough to have the patience to work your way up from the smallest contests until you can reasonably afford the larger ones. The basic strategy that all players use when entering events is to pick out a handful of their favorite golfers for the week and to build a couple of lineups around this core group. For the more expensive events, that tends to work out just fine to help in building one or two teams. Where we see people starting to have trouble is when they start building 10, 20, 50 or as many as 150 lineups to put into events. Players forget about the basics of lineup construction and start just throwing everything at the computer screen and hoping that they cover all the possible outcomes that they could envision for the tournament. The problem with this shotgun method approach is that it becomes more like buying a bunch of lottery tickets rather than having a coherent strategy. What tends to happen when this methodology is employed is that the results are scattered all over the board. Maybe there are a couple of teams that stormed through and made a nice run, but more than likely, even if you picking skills are a little better than average, your results are still going to be generally spread out from top to bottom. Now, if you happen to hit that perfect lineup right on the screws, good for you. We’ll say that was exactly how we drew it up. Unfortunately, that is rarely going to be the case and having your results spread across the spectrum of entries will usually result in a loss from week to week and will result in an average player losing money over time and not really understanding why. They think they are playing it safe, but the reality is that they are virtually assuring themselves of losing money. Fortunately, we have developed a lineup generator that can make this entire process much easier for you moving forward. Have you ever noticed that the best and most successful GPP players tend to either do really well or really poorly in a given week? Take a look at some of the bigger names next time you have the chance. You will be amazed that on the weeks they did well, it seems like every lineup they played was in the money. In a $3-8 GPP, you may see someone with 8-10 lineups in the Top 100, which always blows my mind. What these players recognize better than the average player is that with most of the prize money concentrated near the top of the leaderboard, that rather than having one team have a shot at winning it all, they position themselves to have many opportunities to win. They do this by being very core driven in the players that they select each week and keeping the core and peripheral groups on the small side. When one of their core groups comes through and plays well, it gives them many chances to win rather than hoping that the one great ticket makes it to the end. There are weeks when players like this get totally wiped out for GPPs, but the upside is that when they do play well and pick a group of contenders, they tend to clean up. These players are willing to accept an 80-90% loss in GPP play over a few weeks if it means that they can put themselves in great position to win big on the handful of weeks where they picked players perfectly. This should be your mindset when competing in the smaller buy-in events with huge fields…all or nothing. Stick with your convictions and embrace the volatility. It’s no different than with NFL where you are really only expecting to have maybe 3-4 big weeks each season and understand that much of the rest of the time is simply about limiting losses. The next part of my column will dive into the meat of what we have been studying and take a deeper look at the lineups for winning GPP players over the last season. The primary events that we looked at were the $3-8 GPP, the $300-400 GPP and various middle level buy-ins of $20, $27 or $33. Each type of event has a little different strategy to it so we will take it piece by piece in breaking it down.